Apple intros new iPad with 9.7-inch Retina display and Touch ID. Apple today updated its most popular-sized iPad, featuring a brighter 9.7-inch Retina display and best-in-class performance at its most affordable price ever, starting at $329 (US). iPad features a beautifully bright Retina display with over 3.1 million pixels for stunning pictures and videos, and is enclosed in a sturdy yet thin aluminum unibody enclosure weighing just one pound for great portability and durability. The Apple-designed A9 chip with 64‑bit desktop-class architecture delivers fast processing and graphics performance for apps and games, while maintaining the same all-day battery life. The front- and back-facing cameras offer exceptional low-light performance and HD video recording, making it fun and easy to FaceTime with friends and family and capture unforgettable memories using the large Retina display as a viewfinder. Ultrafast wireless means connecting with iPad is quick and easy, and support for LTE cellular bands worldwide helps customers stay connected when traveling. Apple SIM makes it even easier to connect to wireless data plans right from your device when traveling in more than 140 countries and regions. Touch ID gives iPad users a simple and secure way to unlock iPad, keep personal information private within apps and approve purchases from the App Store, iTunes Store and iBooks Store. With Apple Pay on iPad, paying for physical goods and services within apps or on a website in Safari has never been easier. ◾ iPad comes in silver, gold and space gray and starts at $329 (US) for the 32GB with Wi-Fi model and $459 (US) for the 32GB Wi-Fi + Cellular model at Apple.com and Apple Stores. ◾ iPad is available to order beginning Friday, March 24, from Apple.com and starts delivering to customers and arriving next week in Apple Stores, through select carriers and Apple Authorized Resellers (prices may vary) in the US and more than 20 countries and regions, including Australia, Canada, China, France, Germany, Hong Kong, Italy, Japan, Netherlands, Spain, Sweden, Switzerland and the UK. Denmark, India, Mexico, Norway, Russia, Turkey and other countries and regions will follow in April. Brazil, Taiwan and other countries and regions will follow in May. ◾ Polyurethane Smart Covers for iPad are available for $39 (US) in charcoal gray, white, midnight blue, pink sand and (RED) at Apple.com and Apple Stores. 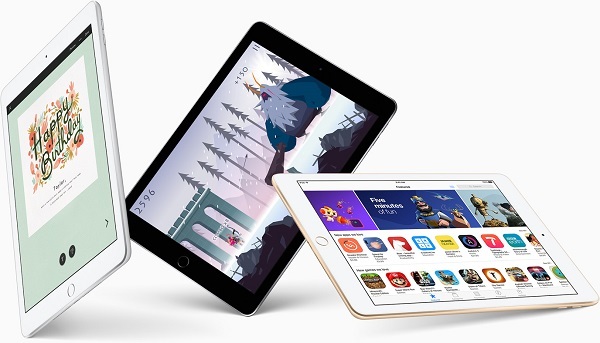 ◾ iPad mini 4, available in silver, gold and space gray, now offers more capacity for the same price starting at $399 (US) for the 128GB Wi-Fi model and $529 (US) for the 128GB Wi-Fi + Cellular model at Apple.com and Apple Stores.